After being snuck into the country, the client was placed in the deportation process, and was also detained in immigration prison. 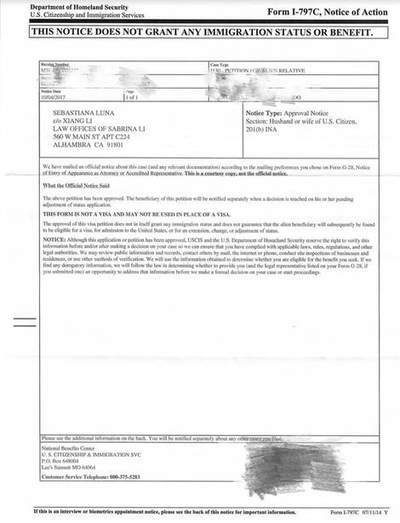 After the client’s family signed with our law firm, we immediately prepared materials for the client’s bond hearing, and finally, with our meticulous preparation and our attorney's wonderful performance at the hearing, the client was successfully released on bail notwithstanding three criminal convictions on the client’s record. Bail for the client was also set at a very low $5,000. The current immigration policy has tightened, and case approval has become stricter. Many clients are receiving Requests for Evidence or Notices of Intent to Deny after personally applying or after hiring immigration intermediaries inexperienced in U.S. law to handle their applications. 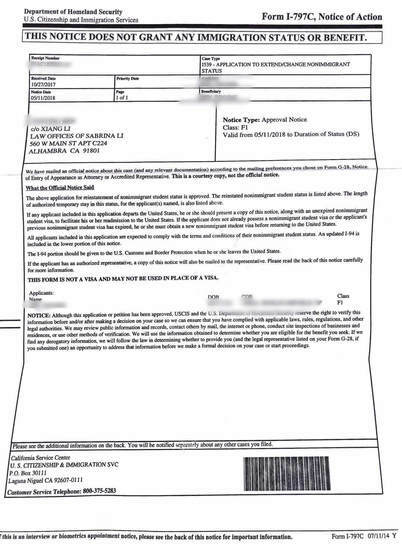 After leaving the case to an intermediary, a client received a Notice of Intent to Deny from the U.S.C.I.S. However, with the attorney’s professional guidance and careful preparation, the decision of the U.S.C.I.S. was reversed, and the asylum approval was finally obtained. 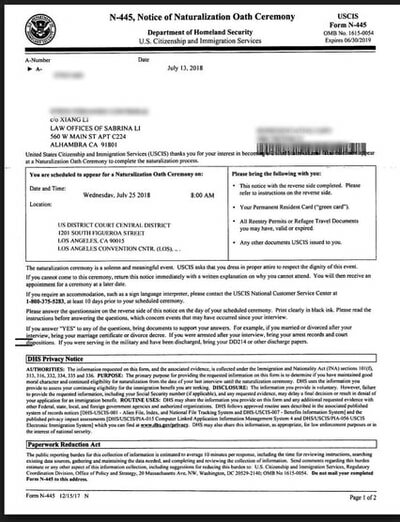 ​The client submitted materials to the U.S.C.I.S. on time, and the package was received by and signed for by the U.S.C.I.S. However, the U.S.C.I.S. issued a denial under the pretense of late submission. The Law Offices of Sabrina Li, P.C. 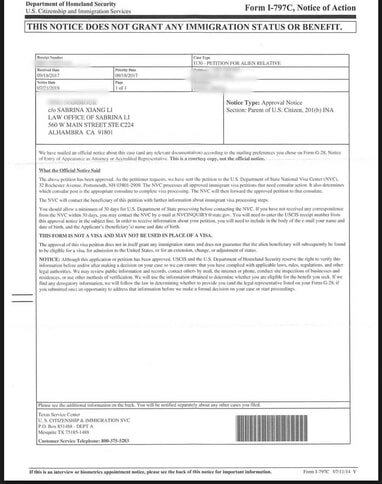 approached the case from the client's point of view, and in order to avoid a longer waiting period and additional costs for the client, Attorney Li advised the client to directly request from the U.S.C.I.S. an admission of their mistake. In three days, the case was successfully reopened. ​The U.S. will consider all aspects of the applicant, especially the moral character. Normally, having a criminal record will have a huge impact on the Application for Naturalization. The client had a criminal record due to domestic violence. 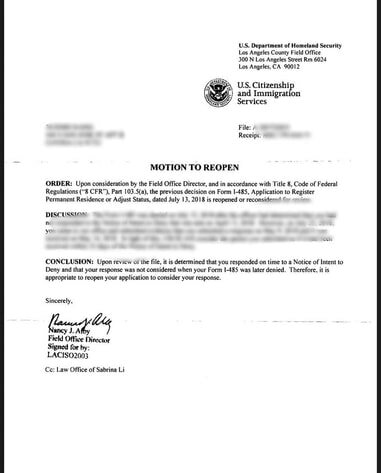 Nevertheless, with the help of Attorney Li, who personally accompanied the client to interview, the client passed the naturalization interview and was able to obtain U.S. citizenship. 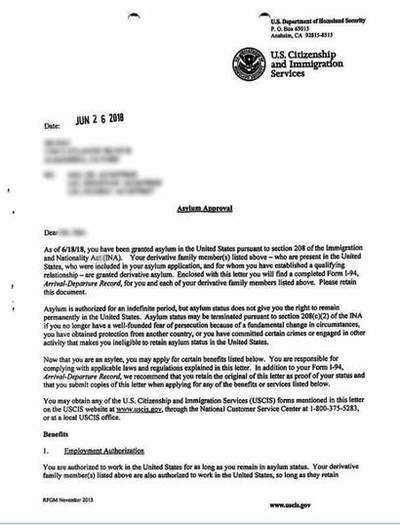 ​According to U.S. immigration laws, asylum can be granted to people who are already in the United States who are persecuted because of their ethnicity, religion, nationality, membership in a particular social group, political opinion, and who have a well-founded fear of persecution or are unable or unwilling to return to their countries. After being granted asylum, you are allowed to live and to work in the United States. You can also apply for permanent resident status (green card) one year after being granted asylum. After signing with the Law Offices of Sabrina Li, P.C., materials were carefully prepared, and the guest underwent many sessions of trial prep. 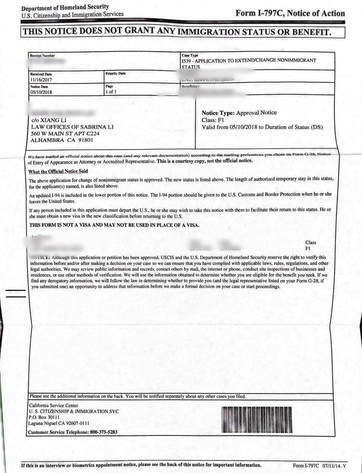 The asylum application was submitted in January, and the application was successfully approved in June. ​After traveling to the United States for vacation, many people discover that they yearn deeply for the American way of life. They want to study and live here, and wish to apply for a student visa. The Law Offices of Sabrina Li, P.C. provides Adjustment to Student Status within the U.S. services, and clients do not have to return to China to re-interview to apply for their student visas. 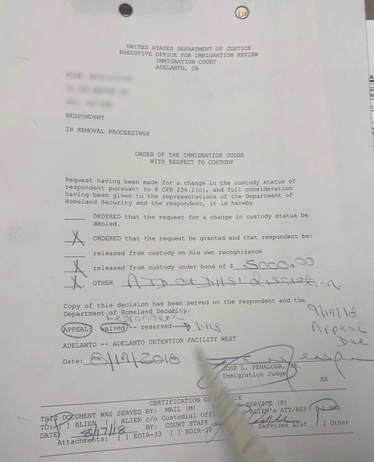 The former intermediary of the client submitted an I-20 from an unqualified school to the U.S.C.I.S. After receiving a Request for Evidence, the client asked us to handle the case. After preparing and submitting over a hundred pages of supplementary materials, the U.S.C.I.S. approved the client's Adjustment of Status application. At present, the success rate of the Law Offices of Sabrina Li, P.C. for Adjustment of Status applications has been maintained at 100%. ​Many international students in the United States lose their status as a result of their own negligence or due to other uncontrollable reasons. Actually, with the help of an experienced immigration attorney, it is possible to get back student status. Last year, a client had student status cancelled during the OPT period, and only realized after the fact a few months later that the client already had illegal status. After hiring us, we submitted a Reinstatement application on her behalf, but we still received a Request for Evidence from the U.S.C.I.S. under the suspicion that the client had fallen into illegal status due to her own negligence. We thoroughly prepared the Response to the Request for Evidence, and there was a successful approval one month later. The client could continue to legally stay in the United States. In the United States, there are always various reasons leading to the loss of current legal status. After the client’s work visa was rejected, the client decided to go to school. He trusted us to handle his case, and even though he had to provide supplemental documents, he was still able to obtain approval. Unless a client voluntarily gives up, the Law Offices of Sabrina Li, P.C. has always had an 100% success rate for Applications for Adjustment to student status.